This was the 2012 Hornby Visitor Centre Scalextric model. This highly limited edition of 999 units was only available in person at the Visitor Centre. The carbon fibre grand tourismo body design and the classical styling elements from the legendary SLR racing cars of the 1950s are blended with the sophisticated design of both the latest Mercedes-Benz passenger car models and the Silver Arrows race cars. With its high performance 5.5 litre V8 supercharged engine, this dynamic machine can accelerate to 62 mph in 3.8 seconds, reach 180 mph in just 28.8 seconds and go on to a top speed of 207mph. Taking much of its aerodynamic design and cutting edge technology from Formula One, the SLR is one of the fastest road going sports cars. 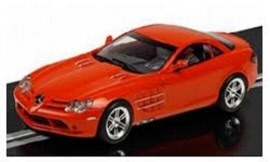 This model really captures the stunning good looks of the SLR McLaren with a very high level accuracy and with fantastic attention to detail around the front grills, wheels and its overall body shape. The car features Magnatraction™, front and rear lights and easy change pick-ups. 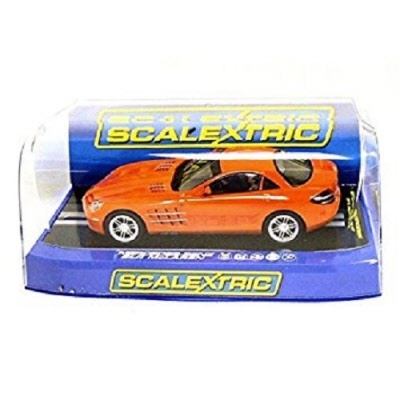 The Mercedes-Benz can be converted from a standard Scalextric car to work on Scalextric Digital layouts using an in-car microprocessor module (C7006). The conversion requires hobbyist skills and some tools including a soldering iron. Each box carries a unique limited edtion number. The best eCommerce software by ShopFactory powers P2317. All-in one eCommerce and shopping cart software.